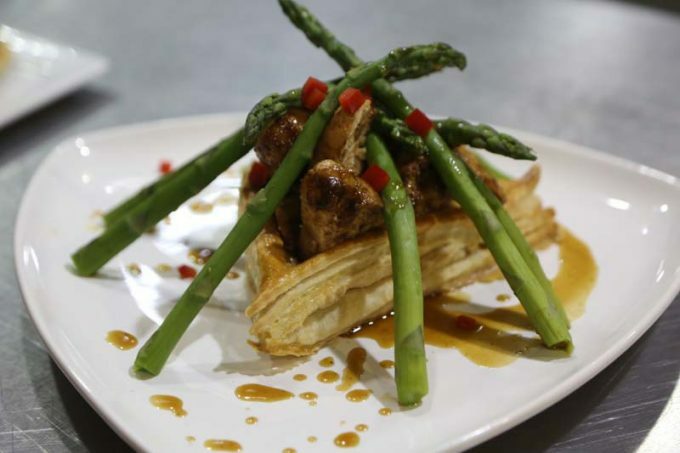 Surfas 6-Week Professional Cooking Course (Level 2) + Team Cooking Competition is designed to take your skills to the next level! 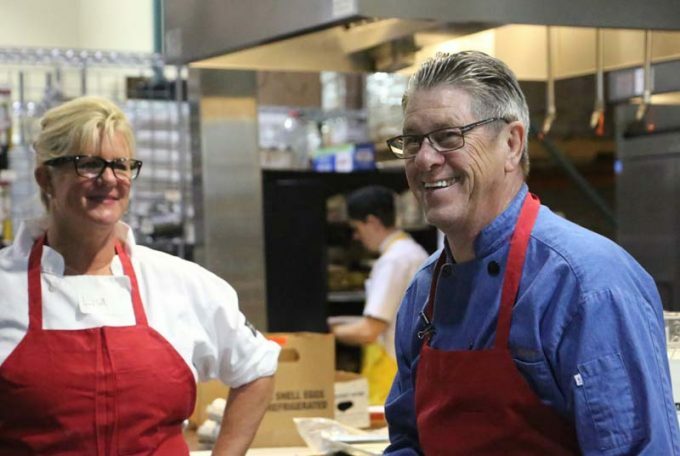 No matter where you are in the culinary world, I guarantee you will be learning new skills and techniques in what feels like a professional restaurant with a Chef to guide you through every step. 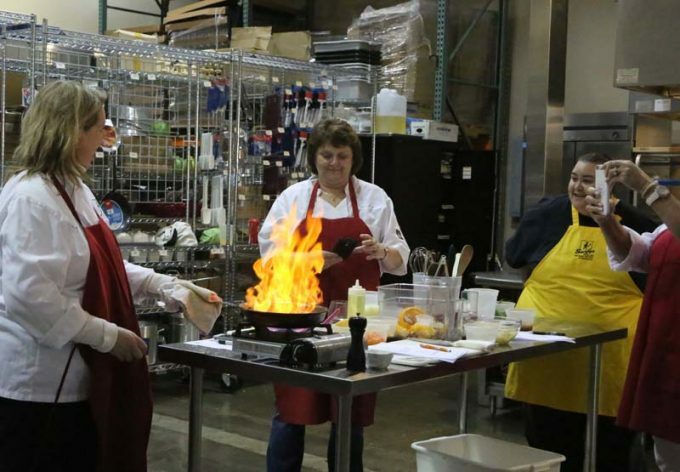 Try out new ingredients, equipment, and master recipes you have always dreamed of making. My favorite class was Pasta, Ravioli, and Cheese. We learned how to make the BEST lasagna I’ve ever tasted in my life. We made house-made fresh lasagna pasta, Bolognese sauce, and ricotta all from scratch. All I can say is, thank you Chef! This recipe will be with me for life! Have you ever loved doing something with such enthusiasm that when you get around of your kinda people you just feel like it’s one big happy family? 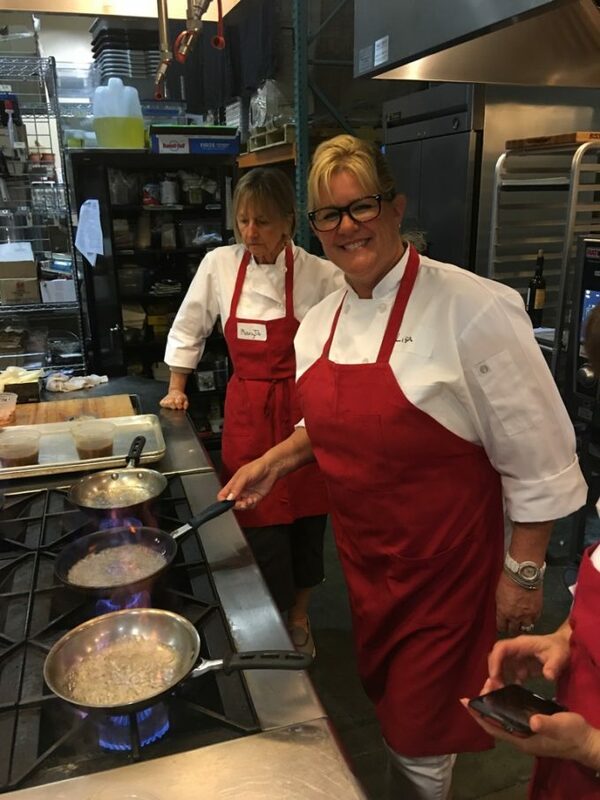 Surfas offers all kinds of cooking classes, and I plan on taking as many of possible in the future. But of course I started off at the Pro level, and why not? Since there was not real prerequisite I figured hey I can be there with all those “Pros”. Classes are open to any skill level and for those 18 or older, and classes are held in their beautiful Surfas’ state of the art Test Kitchen. 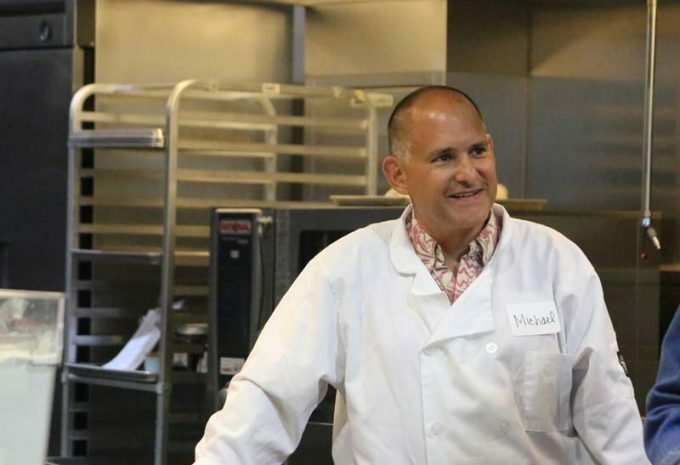 The Surfas Costa Mesa Test Kitchen is outfitted with the latest state-of-the-art commercial kitchen equipment. 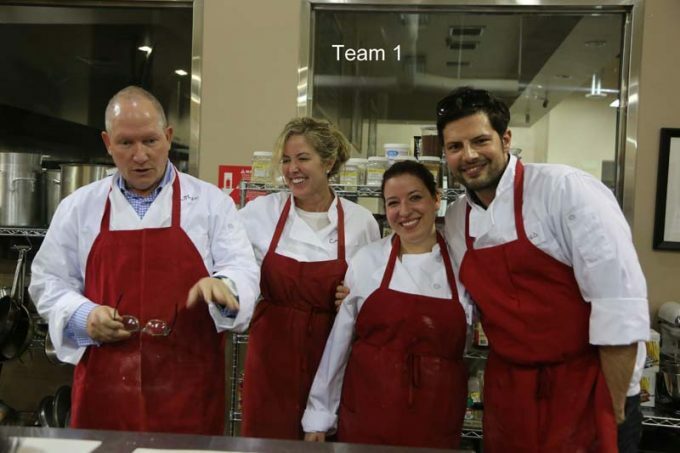 The space may be used for chef demonstrations, cooking classes, book signings, and team building workshops. Additionally it is able to seat 110 comfortably with 110 chairs, five 6 foot tables, one 8 foot table, and four 6 foot culinary work stations available for use. The space is outfitted with a wireless microphone, TV monitor, and adjustable camera. 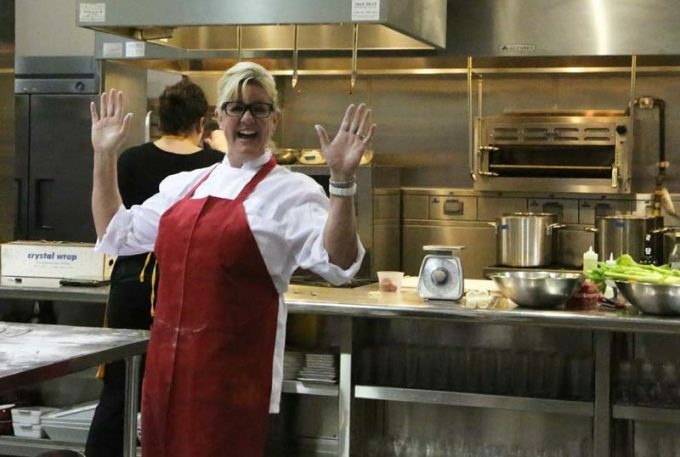 Think of the Costa Mesa Test Kitchen for your next group party, meeting, or filming. 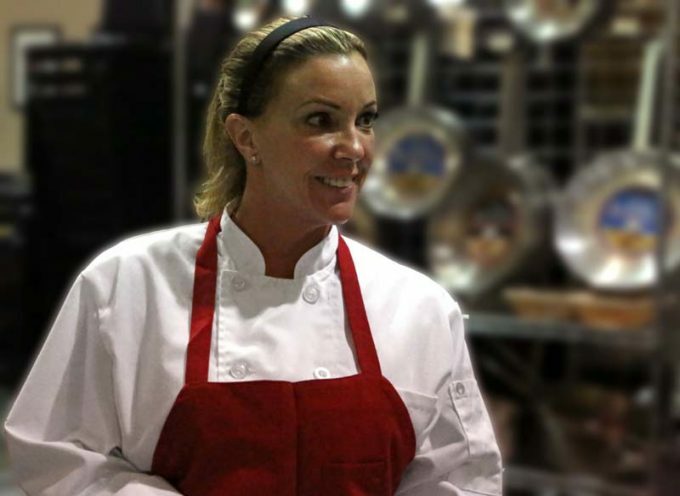 Chef Dominique Fournier has extensive experience in the culinary world. 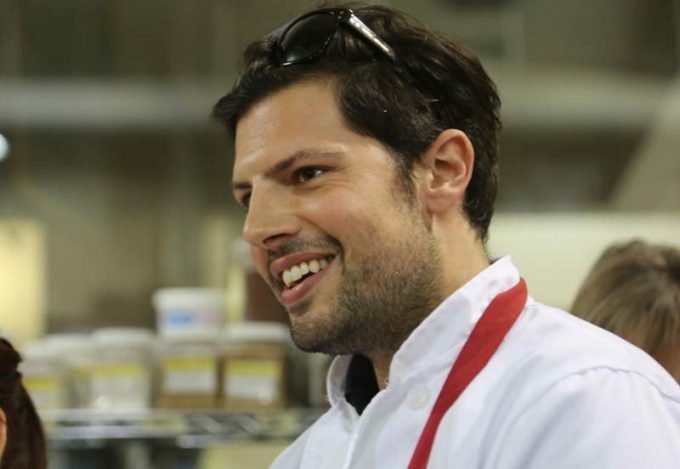 French-born and trained, Fournier has been an Executive Chef for many notable 4 star restaurants from coast to coast including La Parisienne in California and Citronelle in Washington DC, as well as, restaurants in Paris and Corsica France. 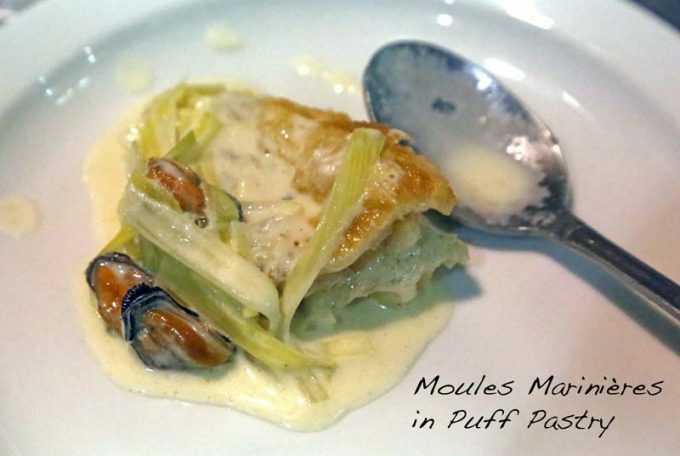 Chef Fournier enjoys combining traditional French cooking with modern flair. 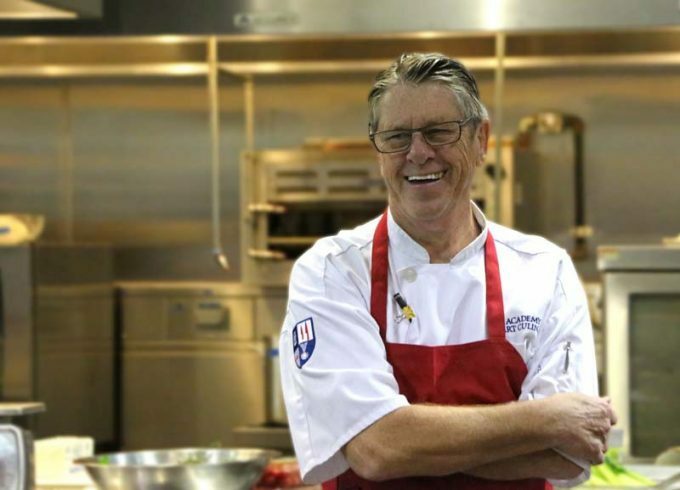 With 30+ years of experience, Chef is creative and methodical in his cooking and eager to share his experience to educate people about the art of food. 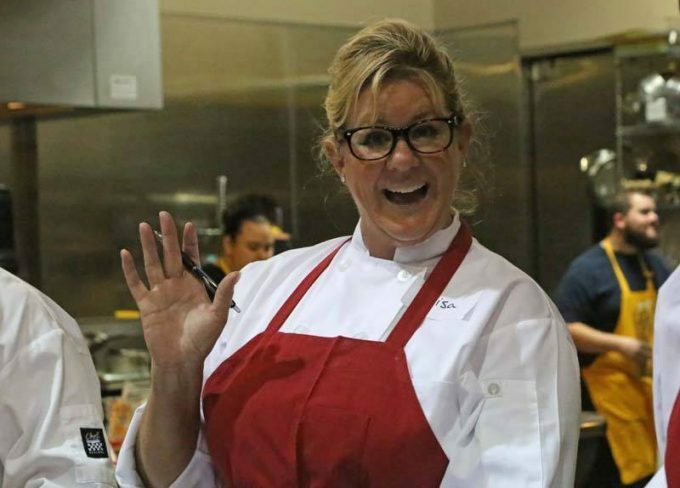 Join Surfas in welcoming back Chef Dominque Fournier to 2nd professional series, hands-on cooking class. 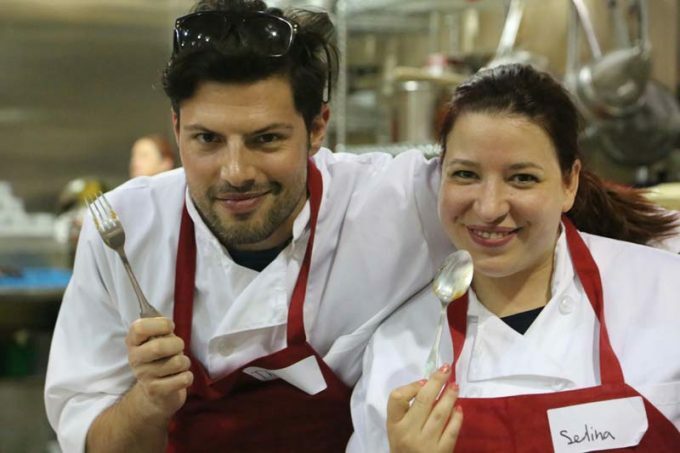 Chef Fournier will guide you through both basic and advance recipes which are essential to a great cook. 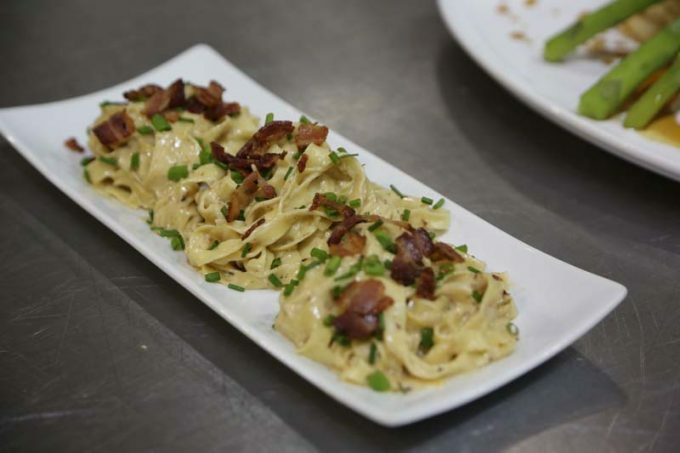 Through the 6 weeks students will learn knife skills, the basics of sauces and stocks, and how to garnish and finish each dish. 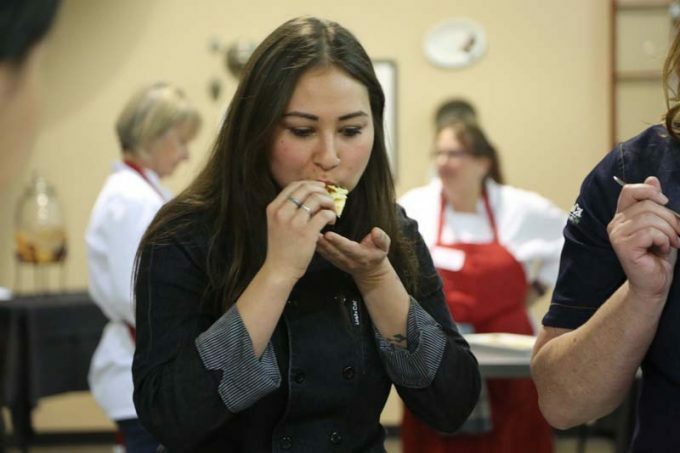 You will also perfect your skills by fabricating a whole fish, creating puff pastry, and compete in a final cooking competition. 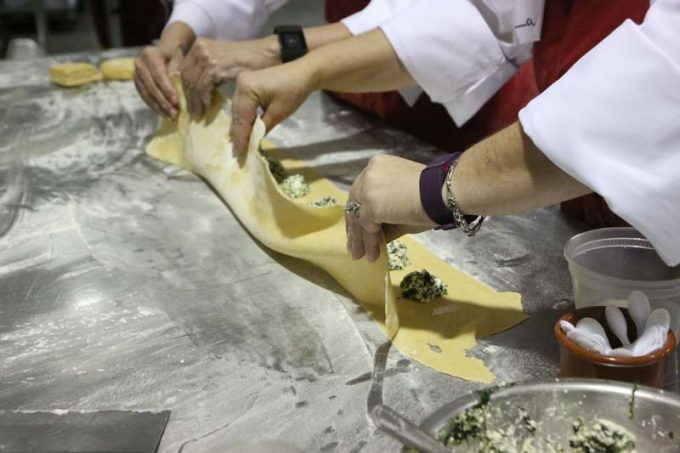 Designed for all skill levels, this class is perfect for those who want to take their cooking skills to the next level. Pro 1 is not a prerequisite for this class. Seriously Chef, this is the BEST lasagna of my life. 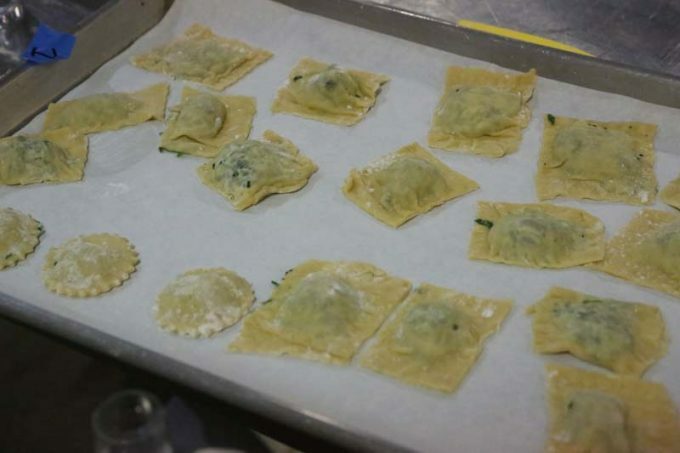 House-made fresh lasagna pasta, we made the Bolognese sauce, and the ricotta. 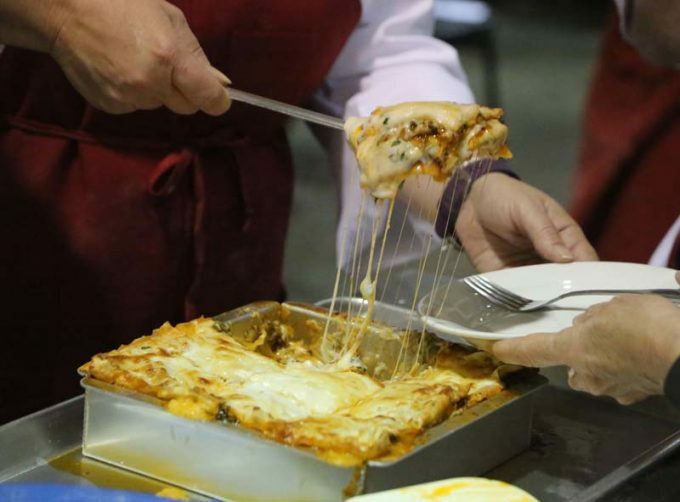 I can still taste this AMAZING lasagna…coming to my website soon! 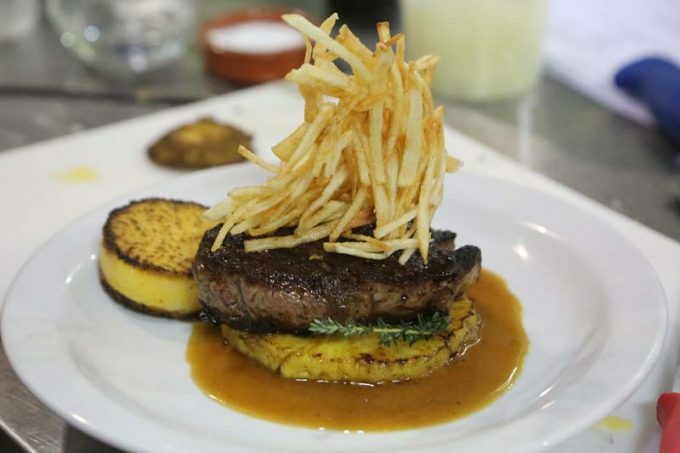 Steak Au Poivre (Pepper Steak) with Grilled Pineapple & Glaze, polenta cake, and match stick Pommes Frites. Moules (mussels) marinière includes white wine, shallots, parsley and butter to cook the mussels. We then baked a puff pastry crust over the soup. Practice what you have learned! 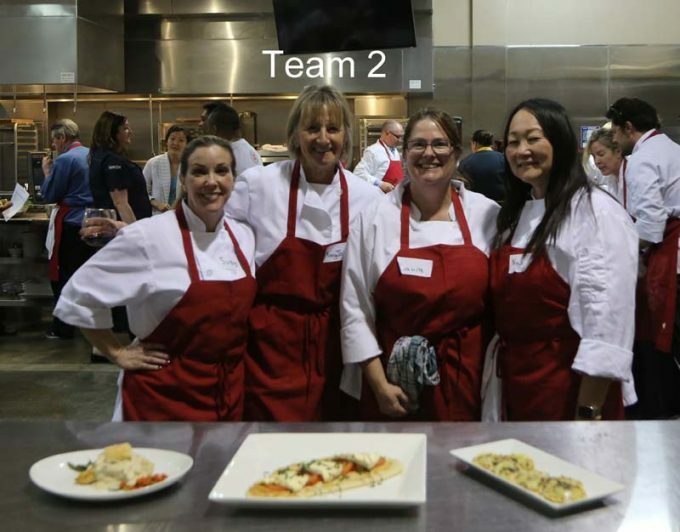 In this class students will be divided into teams and asked to create a full meal inspired by dishes previously learned. 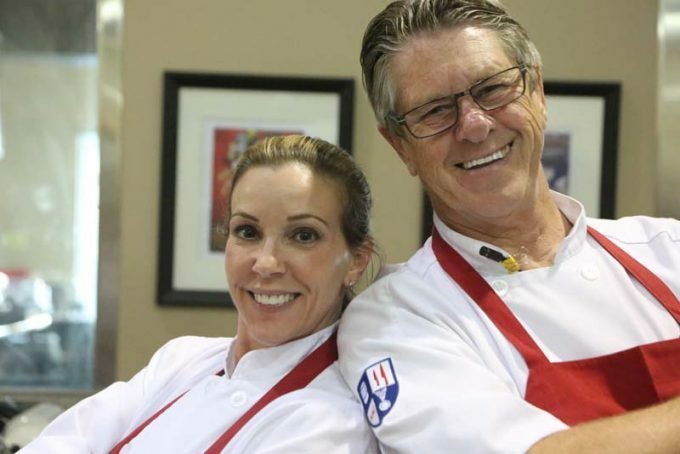 Our Chef Instructor will be assisting and giving advice. 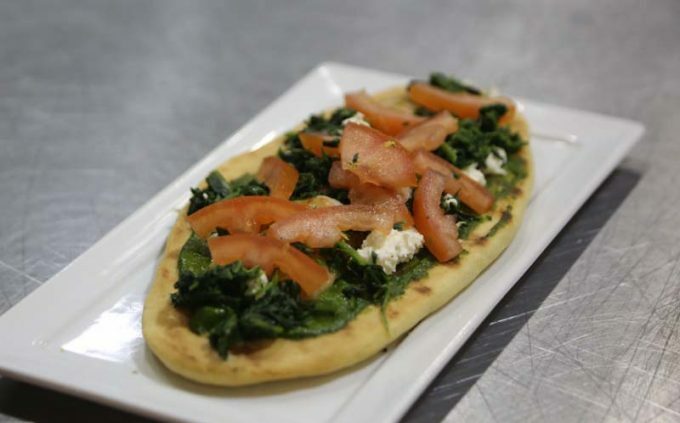 You will then have the opportunity to explain your dish and gather feedback. 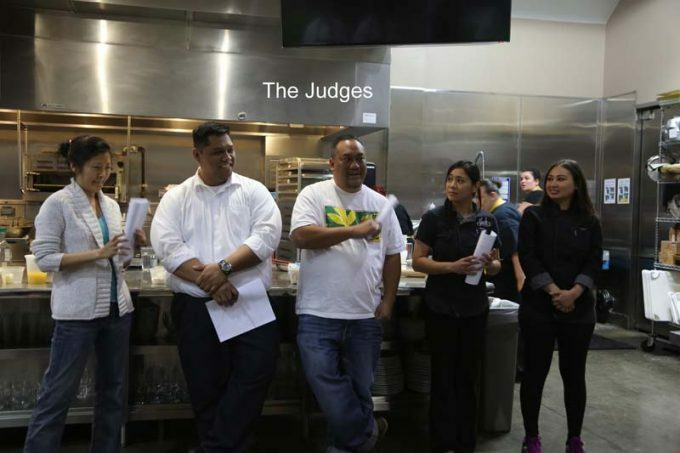 Chef Mina Sacramento of Shuck Oyster Bar will be judging. A team will be presented the winner. Sandy, Lisa (me), and Amy…we were missing Kimberly! One person down, and we had to do all the dishes on competition night! 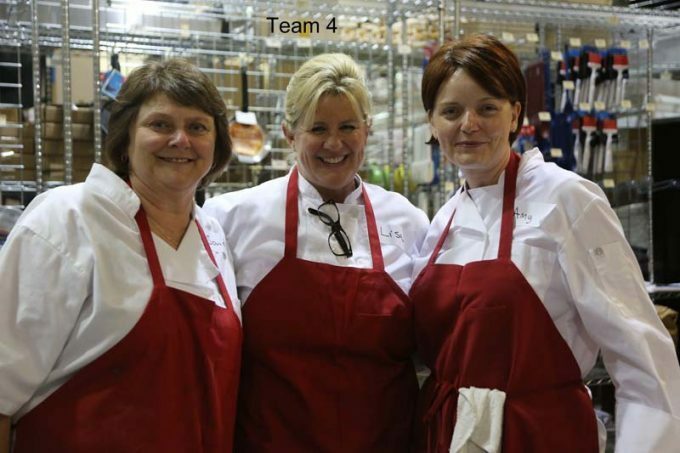 Suzy, Mary Jo, Laura, and Naomi! 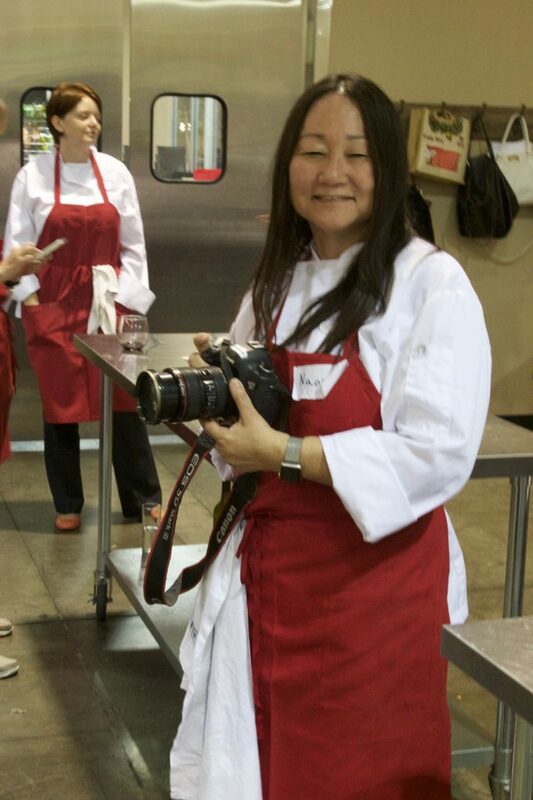 Thank you again Naomi for sharing your photographs of our culinary adventures. 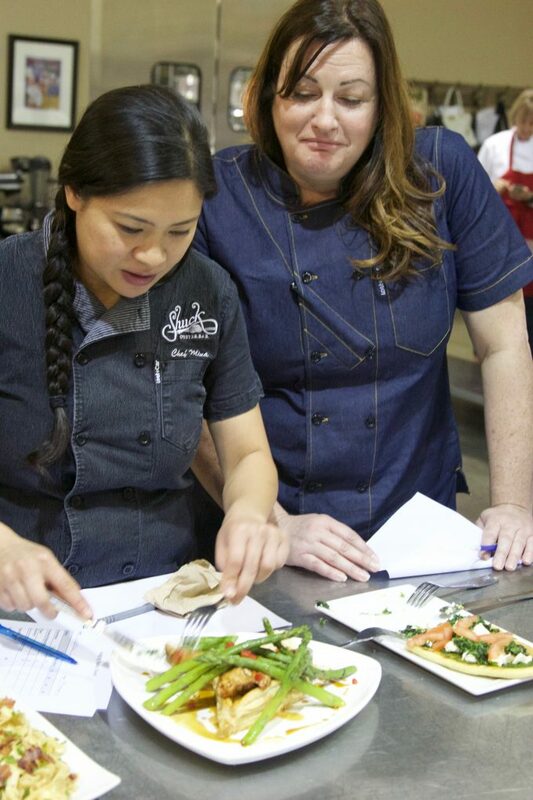 Chef Mina with Chef Stacy looking on…what are they thinking as they taste our dishes? Competition Memories and Notes: We humbly won the competition, and honestly were a bit shocked. 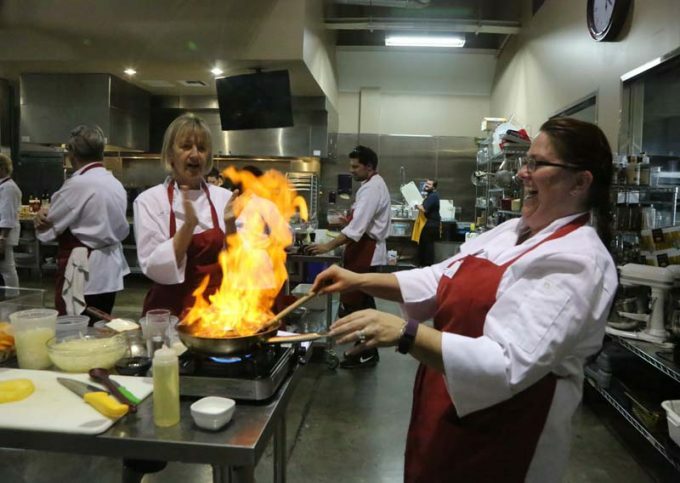 Our class was filled amazing home cooks, serious foodies, and one couple had taken over 30 cooking classes at Surfas. 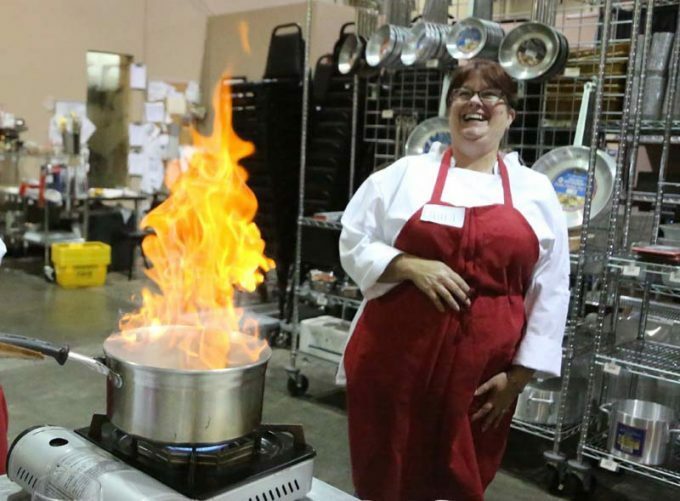 Several other cooking class friends are culinary school graduates, from places like oh a….le cordon bleu. Our menu plan went well, our teamwork was tight even with one member short, and we kept a clean/neat station! 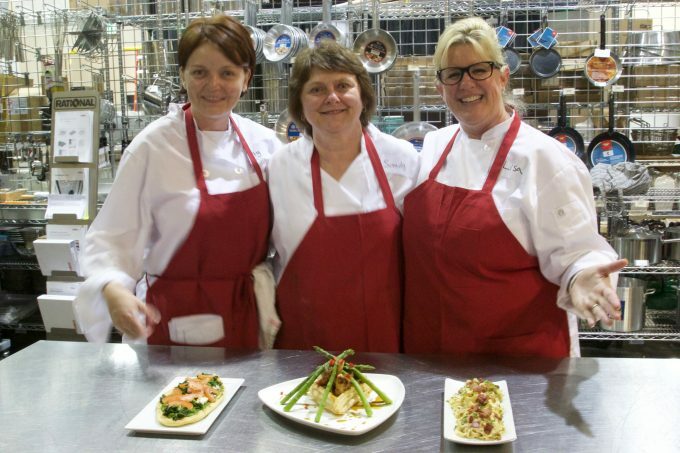 Team 4: Amy, Sandy, and Lisa with our winning menu. 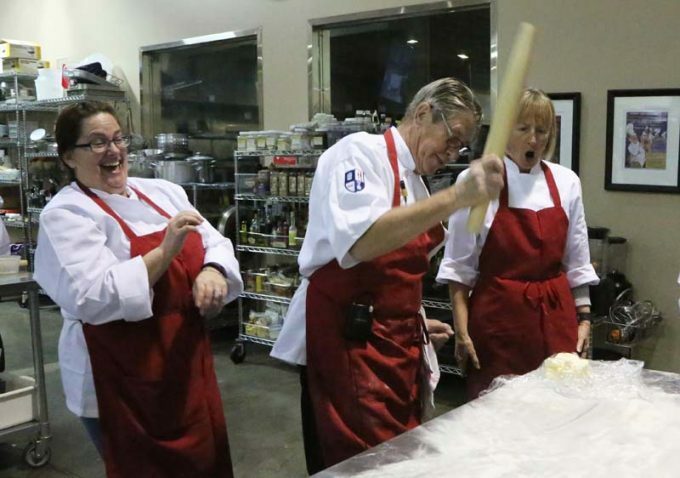 Surfas Cooking Classes are hands-on…literally! 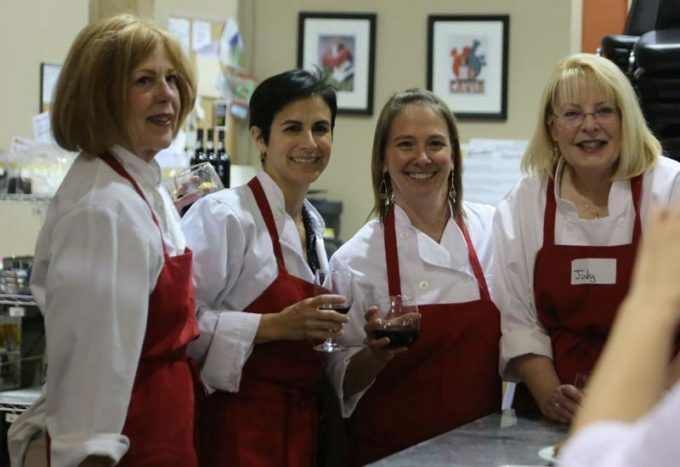 Cooking with new friends at Surfas is so much fun! We all “get” each other’s comments, and food centric lives. We had a great time in class, and many of us are still connected on Facebook to keep in touch! A special thank you to Naomi, for photographing almost every picture in this post! 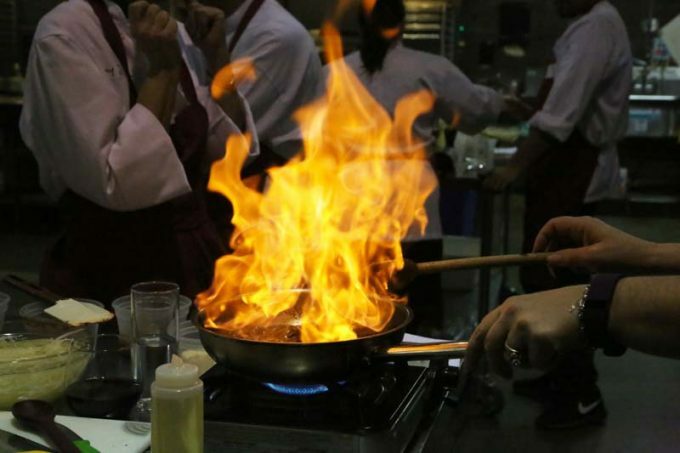 Flambe lessons..don’t worry, we are professionals! Puff Pastry lessons….takes force to get that butter into the pastry! 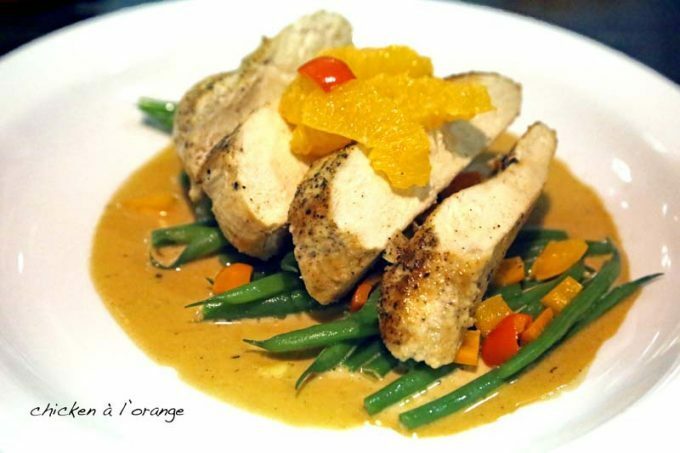 At Surfas, they believe great cooking isn’t just about recipes; it’s about the techniques and essential ingredients. Come experience the difference. 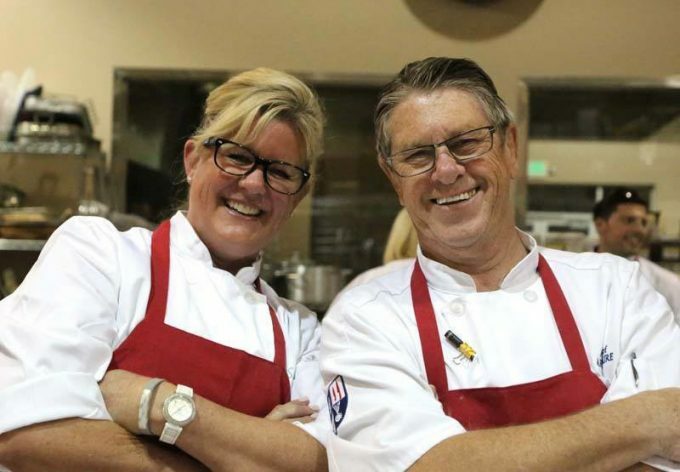 Please call 714-453-COOK(2665) with any questions. Think I look happy and like this is fun?